There was a time when these two would have almost been the same but that is not the case in the 21st Century and has not been for a long time. When I was a young lad growing up my parents and grandparents taught us that your word and a handshake was a guarantee that you would fulfill whatever it was you had agreed to. It did not need lawyers and reams of legal paperwork notarized and certified to be binding because you had given your word and sealed it with a handshake and that settled it as far as you were concerned. You would never consider failing to fulfill your part of the agreement even if it was to your detriment to do so. Your word was a representation of your character and your name was the most valued possession you had. Truthfully, even in that generation there were unscrupulous individuals that were shysters and cheats who could not be trusted but for most people it was the normal and expected way of life and doing business. We had a small farm and one of the crops that we grew to sell was peas and dad would sell them by the bushel and had two prices. One price if the individual picked their own and a slightly higher price if we picked them, and naturally we kids never thought the price was enough for us picking them. Although Dad loved us and valued our labors he did not consider it an unreasonable expectation to send us to the field to pick peas for someone while he and they sat under the shade of the Sycamore trees beside the house drinking coffee or iced tea and chatting. When we came in with the harvest he would frequently send us back to gather a few more peas because his bushel was “good measure, pressed down, shaken together, and running over.” It was not a bushel it was at least a bushel and one-third to one-half more. To him anything less would not have been honorable and I learned to appreciate his reasoning, especially after I became a Christian. I have seen him refund money when someone would mention that some of the peas from a previous purchase were not 100% fully mature. Often he and we knew that this complaint was nothing more than an attempt to get something for nothing but he never flinched and always went above and beyond in his business dealings. He would say, “My reputation is worth more than a few dollars.” He worked hard and gave more than a full day’s work for a day’s pay and expected the same from us. Laziness was not tolerated and failure to keep your word was not excusable. A CONTRACT can be defined as a “written or spoken agreement, especially one concerning employment, sales, or tenancy that is intended to be enforceable by law.” Supposed synonyms are: agreement, covenant, treaty, pact, or compact and I suggest that those are not appropriate. 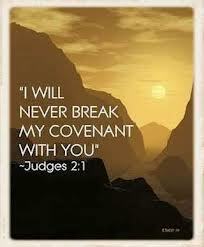 In this would be promises of blessing for keeping the covenant as well as promises or curses for breaking it. The terms would be detailed and verbalized and there would be an “oath” or a “vow” – a solemn affirmation with an appeal to God to watch over the agreement and be the final judge and arbiter of the agreement. 2. The Blood of the Covenant. There were always sacrifices signifying that to break this covenant or agreement would result in death and could only be invalidated or death. It was a signifying of the total involvement and investment of the individuals in the agreement. 3. The Seal of the Covenant. Very often would be a cutting of the flesh and at times gun powder or something of the like would be rubbed into the wound so that the scar would be forever noticeable and recognizable. It was an identifying mark that one had “cut a covenant” and that they had bound their very lives to the fulfillment of that agreement. Honestly we know almost nothing of that mentality in today’s world and our government has no thought of their Constitutional Covenant with the American people. Their oath of office is virtually meaningless to them and there is no sense of obligation to keep it at all costs. That is one of the reasons that we have such a mess politically in today’s world. If every elected official recognized and acknowledged that when they take the “Oath of Office” to faithfully perform the duties of that position and uphold and honor the Constitution we would not be in the mess we are in today politically or economically. Party distinction would be virtually unimportant and partisan politics and gamesmanship would be non-existent. Those elected to office would truly be representatives of WE THE PEOPLE and the BEST GOOD of the nation and the people would be the top priority. Instead we have a climate of cronyism, favoritism, corruption, and the insatiable desire and drive for power and position. We have lost what our founders established and as far as I can see the old saying about used car salesmen applies to politicians – “You know they are lying when you see their lips moving.” Honest Politician is deemed to be an oxymoron and that is a sad indictment on where we have declined as a people. Many are crying out for a “Restored Constitutional America” but too many accept the modern Contract Mentality as normal instead of insisting on a Covenant Mentality in our dealings in the business, social, spiritual, and political arenas. I will declare that UNTIL we come to the place that we fall on our faces before God and repent and demand and determine that we will not only be Covenant men and women who honor our Agreements we will NEVER see the America we so desire. Will we ever see it? I do not know but if we do not strive for it we will leave a legacy for those who follow us that will go deeper and deeper into an amoral state that can only produce destruction and decay. I have been wordy and possibly failed to communicate the deep cry of my heart to see men and women return to a mentality where we “honor our word” with one another, as a nation, and a people. I want to see a society where the normal thing is people doing, the “right thing” even if it does not give them a particular edge or windfall profit. I believe that this would give us a platform for “limited government”, a “massive reduction in violence”, and a “new civility” that would not only get the attention of the rest of the world but would produce a prosperity and growth in new innovations that many of the plagues that terrorize our world would be addressed in a significant way. We can see “healing come to our land” but that healing must first begin in each of us. If this resonates with you then all I ask is that you consider taking steps personally that will insure that you live as a Covenant Person who keeps their Contracts and Agreements – – KEEP YOUR WORD! If enough of us demonstrate that lifestyle and insist on it from politicians, in business, socially, relationally, and spiritually we will see America the Beautiful returned to prominence and the Light of God will break through the dark clouds of despair that now enshroud this world producing a new and renewed hope that will be life changing. That’s the end of my rant, sermon, political speech or whatever you choose to call it. May God bless, protect, and provide for you and may God defend and deliver America! Thank you for your time! I was appalled by Bob Costas on Sunday evening in his rant over the tragic situation in Kansas City where a murder and suicide took place leaving a 3 month old little girl an orphan. He used the tragedy and crime as a springboard for the left-wing agenda to destroy our 2nd Amendment Rights and disarm American citizens. It is not a new example of opportunistic use of a crisis or tragedy to put forth a political agenda. This was clearly expressed by the Obama administration early on when Mr. Rahm Emanuel declared, “You never want a serious crisis to go to waste.” Forget the people hurt, the real issues just use it to gain political mileage for your radical agenda! I WAS APPALLED! Mr. Costas people having guns are not the problem people are the problem. In this particular instance there are so many factors, many of which have yet to surface that played a major role in this tragedy and not one of them involve the need to DISARM LAW ABIDING AMERICAN CITIZENS. I admit I have never been a Costas fan but this pushed me over the edge with regard to watching him in the future. Realizing the network that employs him, I am not the least bit surprised by this but it was the wrong time and the wrong place for the argument. I disagree with the argument to begin with but if someone wants to broach it I have no problem with that but to take advantage of the situations sensitivity as well as the timing and the pain being endured not only by the families but possibly thousands of other people it was inappropriate. Mr. Costas, we already know that Mr. Belcher had some serious problems prior to this incident. He and his girlfriend, the mother of his baby were having problems and had been for some time. According to reports they argued frequently and sometimes it got very tense. According to statistics of the over 1700 players in the NFL about 2% of them have faced abuse or violence charges. But, nobody is blamingfootball for this, head injuries, the medication he was taking, drinking, and a host of other things. Oh no, they blame the evil gun. Forget the fact that, if we are honest, this was a MURDER then a SUICIDE and so the issue was not the gun it was the individual. I don’t know and don’t pretend to know what mental, physical or emotional issues he might have been having. Recently in Arizona a man killed two family members with a Crossbow and then himself with a knife but nobody suggested that we ban bows, arrows, and knives. There have been multiple NFL players involved in situations where intoxication while driving was the problem but nobody blamed the car or the alcohol distiller for the problem. When thousands of teenagers are killed in Chicago and other cities across this nation over things as trivial as loud music nobody is blaming the “Gangsta Rap” with its violent lyrics or the home environment where the teen lives in a single parent home where the father has multiple children with multiple women and bails leaving the mother to do the best she can nobody is blaming personal responsibility they want to blame the evil gun. THE GUN IS NOT THE PROBLEM PEOPLE ARE! Saying that guns do not keep us safe from government is a broad generalization that won’t hold water. While I am willing to concede that my guns might not keep a rogue government from inflicting harm if it so chooses, it will protect my family if a thug breaks into my home at 2 A.M. to do whatever it is he or she has in mind. My guns will protect me if I am in a public setting and a lunatic with a gun decides to shoot everybody in the place. I just might be able to save my life and the lives of countless others because I have a license to carry a firearm and do. I am well-trained and know how to control my emotions so that it would be inconceivable that I would allow any situation to escalate by my actions that would lead to violence. If I place my 9mm on your coffee table how long will it be before that gun gets up and shoots someone? IT NEVER WILL! There is always a loose cannon at the end of the gun to cause that problem. Recently I read that a man took a piece of rope and strangled his wife and two children but didn’t hear anybody wanting to ban rope. A mother in Texas drowned her children in the bathtub but I didn’t hear cries to ban water and bathtubs. I’ve known of situations where people took prescription medication to not only take their own lives but cases where they used it to take the life of another but didn’t hear anybody suggesting that we ban all prescription medication, some of which is needed to keep their personality disorders in check so that they are somewhat functional. The argument that because of this incident or any incident like it suggests that we need to ban all guns is more than ludicrous it is a direct assault on the 2nd Amendment and lacks reason and sensibility. If you are a gun control activist and sympathetic with this type of action and decide to disassociate with me I’m sorry to see you go but I am adamant about my belief in this and will not change. You can pass all the gun bans you want yet people lacking sensibility and rationality as well as criminals will find a way to get a gun or something else to commit their crime. YOU WILL NOT SAVE LIVES, in fact you will cost them. Statistics support my argument because in the states that allow concealed and even open carry there is less gun violence than in those with strict gun bans such as Washington DC and other parts of this nation. Mr. Costa, Mr. 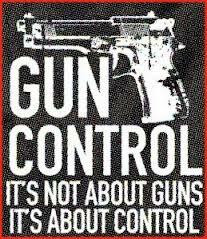 Gun Running Attorney General, Mr. President, and every progressive, socialist, liberal that wants to ban guns I say to you – GET THE FACTS! There is little doubt that someone in Congress was waiting on this because before this man’s body was cold there was something on the floor to BAN GUNS. No doubt it had been prewritten and they were just waiting on something to allow them to float this idea again. It is a continual barrage and assault on every law-abiding, constitution believing American and the first step in a Tyrant being able to take over is to “disarm the citizens.” I’m afraid I have to agree with the words of Charlton Heston on this, “Out of my cold dead hands Mr. President.” I do not intend to leave my family unprotected in the face of the level of depravity that our society has descended. We MUST bombard our elected officials and do everything in our power to protect our God-given and Constitutional Rights if we want to maintain any semblance of being a Free Nation. I urge you to continually stay in contact with your elected officials even if they are strong proponents of this type of measure and let them know that you are strongly opposed to the banning of our right to keep and bear arms. May God bless and protect you and may God deliver and wake up America!